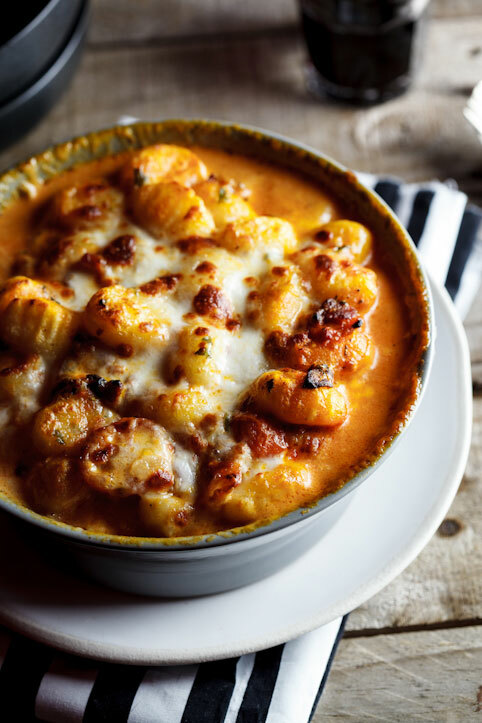 This easy baked gnocchi recipe with smoky bacon, tomato and mozzarella sauce is perfect for rushed weeknights when you need dinner on the table fast. This post was originally written in 2013. This baked gnocchi is comfort food. Comfort food for those who need comforting. And yesterday, I needed it (more than I normally do). You see, yesterday was not only the beginning of the 3rd school term here in SA, but also the day we had to start with Atropine drops on my darling princess. I’m not going to go into what Atropine is (you can read more here, if you so wish) but we are doing it because she has a pretty important appointment at an Optometrist this Thursday. We found out a couple of weeks ago that her eyes are slightly squint (so slightly that we’ve never even noticed) but now there are talks of glasses and surgery and even though this isn’t, by far, the worst thing that could happen, I feel sad. I think as a mom, all you want is for your kids to be perfectly healthy and happy. Again, this isn’t even that big of a deal (and I can’t imagine what it must be like to hear your child is terribly ill, etc). Anyway, so yes, yesterday I needed comfort food. And since I also didn’t feel like spending hours in the kitchen, I knew I wanted to use a few packets of ready-made gnocchi. This isn’t something I use a lot because I really love making fresh gnocchi but it definitely is a life-saver when you’re pressed for time. I also think it works really well in a baked gnocchi dish because it’s quite a lot firmer than home-made gnocchi so the shape is retained while, I think, home-made gnocchi will just get mushy. The sauce is made by frying bacon and then adding both tinned and halved cherry tomatoes and a splash of cream (you could also use yoghurt). The cooked gnocchi is mixed into this and then baked under a blanket of fresh, creamy fior di latte. Perfect, easy comfort food ready in a flash. In the meantime, make the sauce. In a large, hot frying pan, fry the bacon until starting to crisp with most of the fat rendered. Pour off most of the fat then add the garlic and smoked paprika and fry for 30 seconds. Add all of the tomatoes and the sugar and allow to simmer for 5 minutes. Remove the pan from the heat and stir in the cream/yoghurt, parsley and seasoning. Cook the gnocchi in the salted water until it starts floating to the top. Remove with a slotted spoon and add to the sauce. 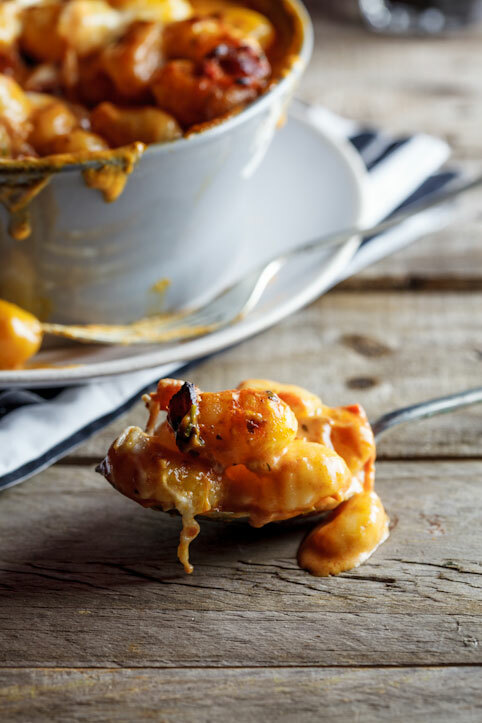 Transfer the gnocchi and sauce to an oven-proof dish and top with the sliced mozzarella. Place in the oven and bake for 10 minutes until the mozzarella is melted and golden. Remove from the oven and allow to rest for 5 minutes before serving. I used my slow cooker for this. I doubled everything. I did everything in the frying pan as recommended but didnt do the simmer at the end. And i used normal paprika instead of smoked. Threw everything together with the uncooked gnocchi into the slow cooker. I added an extra tin of tomatos and half a cup of water. Cooked on low for 6 hours (would be done much sooner but i was out) I added the mozzerlla 2 hours before finishing. Hubby and kids LOVED it. Awesome! I’m so glad to hear that Emma! This is such a gem! 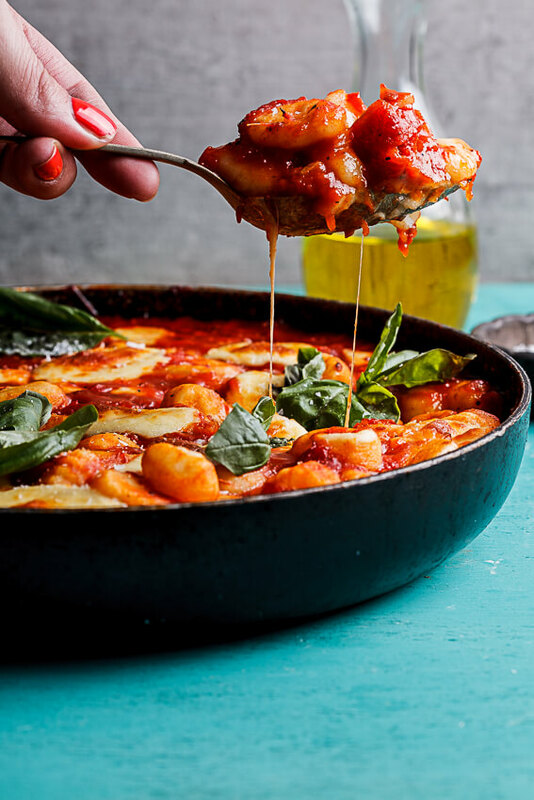 I’ve made it several times and I am happy to report you can just add the gnocchi uncooked to the sauce and let it boil for a couple minutes before baking and it cooks up nicely, no need to fuss with boiling in another pot! I always double the recipe, we just love it! Thank-you for the great idea! So glad you like it Rachael! Great Idea! I have held off making this because comfort food and three or four pans ( including the baking dish) didn’t seem comfortable to me. Im going to have to try this. I use a 12 inch cast iron skillet to cook, mix and bake. Works great. This post really hits home for me, especially today Alida! I am down in Charleston, SC with our oldest son Sean because today he is having Lasik surgery. He has been wearing glasses since 2nd grade and contacts since 5th or 6th. He’s been dying to have this surgery for years. He’s just tired of wearing glasses and having irritated eyes from his contacts. I have been stressed for weeks about it and will be happy when it’s all done late today. Please keep us in your prayers. Sean is perfect in my eyes in every way as I’m sure Abi is in yours, but now I hope the surgery can make his eyes perfect for him. This is a dish I could surely use to comfort me today, but I’ll have to wait til I get back home to give it a go. Can’t wait! this sounds so satisfying and comforting. and yes, just what you need when life is a little hard to swallow. so hard when our kids face any type of adversity. so happy the surgeries were successful. Thanks Cathy! Comfort food for parents in need of comfort. 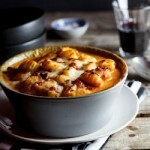 This is my kind of comfort food, Alida – so warm and cheese and tomatoey and delicious! Love it. Wow. This is more appealing to me than lasagna. And i love lasagna! Would be fabulous for company. Thanks! It definitely would! 🙂 And SO much easier than lasagna. So glad you liked it Tanya! Good luck with the last bit of your pregnancy! I found this on Pinterest and made it for dinner tonight. We all loved it, I ncluding my two year old. Fabulous! So glad you liked it Susan! This was a quick meal which I appreciate, but I’m not sure smoked paprika is the best spice for this dish. The flavor seemed overwhelming; I might try regular paprika next time. There are many people who find the flavour of smoked paprika overwhelming but I just love it, especially with the bacon. Regular paprika would also be great but you could omit it altogether if you’d like. What are your suggestions for making this vegetarian? Thank you! Hi alida i just saw your recipe and i’m thinking of making it for my best friend she loves gnocchi anything lol im alil confused if you can help i woukd greatly appreciate it what do you mean by cream heavy cream sour cream? Hi Kassie. What we call “cream” in South Africa is considered “Heavy Cream” in the States. 🙂 I hope you’re best friend loves this! You don’t put the bacon in the dish?? Hi Cici. Of course the bacon goes into the dish. 😉 After you’ve rendered off the fat of the bacon you add the garlic, smoked paprika and tomatoes which becomes the sauce for the gnocchi. 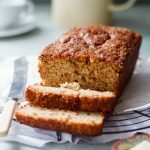 Love this recipe – have pinned it and will definitely plan to make it! Rosemary, wonderful ideas! I hope you enjoy it! 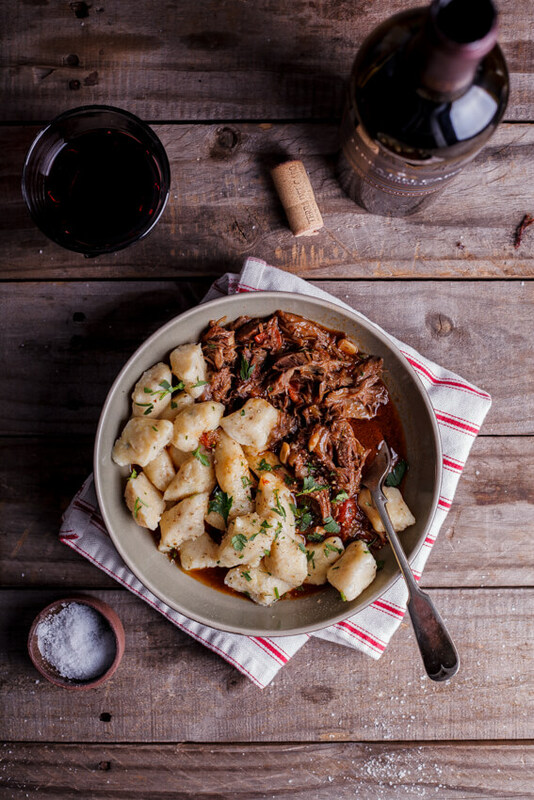 Hello Alida just bumped into your site looking for coffee powder recipes, gnocchi yummy my mum used to make them fresh I will do this recipe but will do fresh gnocchi and add more veggies to the sauce like my italian aunties used to do thanks for sharing so many wonderful recipes. I have made this about a million times since finding it on Pinterest. So easy to make, but really filling and delicious! Going to make this again now:) Thanks! So glad you like it so much. It’s one of my favs too! Wow! SO good! I used fire roasted tomatoes because it’s what I had on hand and cooked up some quartered criminis with the bacon since they needed to get used, but aside from those changes, stuck to the recipe. This is a new favorite! Thanks so much for sharing! Thanks for your comment Jodie. Glad you liked it. I would let the gnocchi dry out a little on a semolina covered tray. Just made this last night. It is so fantastic and really simple. I live in Minnesota so a winter comfort dish like this is necessary! The amounts are really arbitrary, just so you get close you will be fine. There is of course a grams to ounces conversion on the net. I used frozen gnocchi and I thought it became mushy. I’ll search for a better one or make it myself. The flavors,smell and appearance of this dish are wonderful! I doubled this recipe and used the yogurt. Thanks for posting this delicious recipe! Never made anything with gnocchi before, but this was delicious! One of the best things I’ve ever cooked! Thank you! Thanks for the lovely comment Kristin! And I’m so glad you liked this so much. It’s one of my favourites too. This was really good and very quick to make! Thanks! Oh yum! Glad you liked it. This looks A.MA.ZING! Can’t wait to make this – thank you! After tasting all the components, I thought that the dish was only going to be “meh”. Some short of magic happened in the oven! It came out so flavorful. This was my first time cooking with gnocchi and I deem it a success. Also, I used “Italian” tomatoes with the herbs which I think was a nice addition. Also grated some Parmesan before putting it in the oven. Another shortcut I used- I cooked my bacon in a cast iron skillet and combined everything in it, topped with cheese and into the oven, Less mess! Thanks for a quick recipe! So glad you liked it Shawn! I tried this tonight and it was absolutely delicious. My husband and I both loved it. I’ll definitely make this frequently. It was quick and very easy to prepare, and tasted amazing. (I rarely comment on recipes, but this is one of the best recipes I’ve tried from Pinterest.) Well done. Thanks for your lovely comment Michele. Wow! 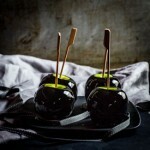 This is an amazing dish and your photos are so professional! Just like if they came from a good magazine!!! Well done! Jessie, So glad you like the recipe! WOW! 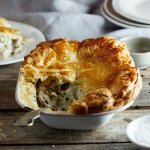 This is one of the best recipes I have ever found online. I made it for dinner last night and both my husband and I were blown away. I am so happy I stuck to the recipe as was stated on the site, my usual behaviour is to add extra this and some of that in most cases. 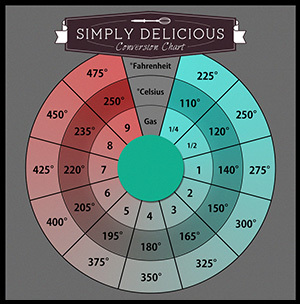 Also thanks for the measurements in grams, even in Canada most recipes speak in ounces which gets to be infuriating when everything is labelled in metric. Hi! I am a college student living in a dorm… so my only way for a home cooked meal is my crockpot! Do you think i could adapt this with canned tomatoes, bacon cooked in my microwave, and then throw it all in the crackpot with some cream? I made this last night and my daughter declared it the best dinner ever! Could you please tell me what kind of cream you used? I use fresh cream. In the US I think it’s referred to as Heavy cream? Made it for dinner tonight. Used smoked bacon, sour cream and fresh basil. Difibetely making it again very soon! Make sure you have bread for the souce after 🙂 thank you! Do you drain the canned tomatoes? Or add the whole tin, juice and all?? Could this possibly work with something besides gnocchi, like maybe penne? Thank you it looks delicious!! Morning from Kildare , there is definitely a touch of Autumn in the air so this looks just about right for dinner tonight. I hope you and your daughter got over the drops , and I hope her eyes are fine. You are doing all the right things for her , not that that makes it easy of course…. Hi there! 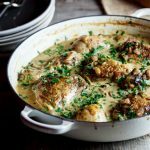 Can you help me convert this recipe without using the grams?? I’m not much of a cook but I would love to make this recipe tonight!!! Thanks!! Shannon, 500g gnocchi is approximately 2-3 cups but it usually comes in 500g packets. 250g bacon is around 1 cup, 400g tomatoes is a medium size tin and 100g mozzarella is around 1 cup as well. If you Google, you’re bound to find an online converter that might be able to give you more info. Thank you so much!!! That was the fastest reply I’ve had! Can’t wait to try this! My daughter is envious of her friends who wear glasses – she even got a fake pair that she wears sometimes! But I feel you. It’s always hard to hear that something is “wrong” with your child! Thanks for your lovely comment M.
I totally know how you feel about your child. I just had to take my seven month old to get an EEG 🙁 luckily the results were fine. Anyway, I can definitely use comfort food and this looks like is sure will hit the spot. I think it’s a good dish for a castiron skillet. So glad your baby is fine! 🙂 A cast iron skillet is a great idea ! 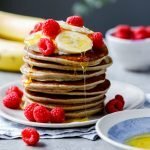 Found your blog through Destination Delicious on Facebook and absolutely had to leave a comment on this post! This dish looks amazingly delicious! New fan here! So glad you liked it Mara! Hi, I found this recipe on pinterest last week and I’ve just made this for our dinner … wow, I’ll definitely be making it again, thank you for sharing! My daughter was diagnosed with a lazy eye, slight squint and long sightedness about 18 months ago just after her third birthday. She’s had patches to wear and wears glasses (very cool frames) but she doesn’t let it stop her. She’s nearly 5 now and about to start school and she’s stunning with her long ginger hair and glasses! So glad you liked the gnocchi Rachel! Your daughter sounds gorgeous! K, this definitely is a ‘treat’ kind of meal but gosh, it really is very good. This looks wonderful, I’m going to try it today! As a side note to your story about your daughter…I worked for a pediatric ophthalmologist for 17 years. We used Atropine for the treatment of amblyopia, is that what she was diagnosed with? And as far as surgery goes, not sure what the surgery is for, just make sure you are going to a pediatric ophthalmologist. An optometrist can’t perform surgery. There are optometrists that are successful in the treatment of amblyopia, if that’s what she has, however an ophthalmologist is probably who she should be with. And one more thing, as far as the glasses go….they have so many different selections for frames that are awesome! Colors, shapes, designers, etc…. She may just be the hit of her class! It’s all good!! I made this for dinner last night- AMAZING! So delicious and definitely perfect comfort food. Hope everything went as well as it could with your daughter’s optometrist appointment. Food looks so yummy!! My daughter is turning 26 this year, she was born with a squint. It was corrected surgically. It was very traumatic for me, more so that for her I think (she was 2 at the time). Technology has come so far since then. Your child will be all fixed and beautiful. And glasses, these days its all the rage, if she needs them, get a really funky pair. Good luck. Be strong. I look at my beautiful daughter (and she really is beautiful), a doctor now, and can barely remember her with a squint. I often make gnocchi with butternut, pumpkin and sweet potato. Just love it. What kind of dish did you use to bake it? size? I used an oven-proof ceramic dish of around 20x20cm. 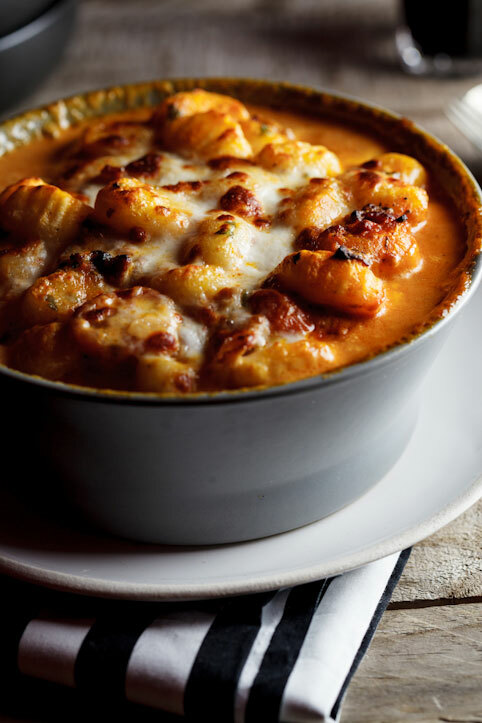 I am not a huge fan of gnocchi, but this looks incredible! Bacon and mozzarella! Nothing can go wrong with those ingredients! I’m going to be making this for the first time this weekend for all our friends! YUM!! Ek sien jy gebruik Fior di latte mozarella kaas. Waar koop jy dit? Hier in die Oos-Rand sukkel ek by ons plaaslike Woolworths om dit in die hande te kry. Dankie vir ‘n heerlike resep en sterkte met jou dogtertjie. Annette, jy kan hulle Bocconcini ook probeer en as jy regtig nie reg kom nie, gebruik sommer hulle gewone mozzarella. Natuurlik is die buffalo/fior di latte lekkerder maar gewone mozz sal ook werk! This is my kind of comfort food! I don’t even care that it’s 100 degrees outside. I want to stuff my face with this! Not only does this sound amazing, it looks it! That looks delicious, I will definitely be trying it. On the glasses front, try not to worry too much (easier said than done!) My “princess” had to get glasses when she was in Grade 3 – I was a wreck, she handled it beautifully. Miraculously enough she has never been teased and loves her glasses, although she does occasionally opt for contacts now that she is 18 years old. You get really lovely “trendy” glasses for young girls now, I think that makes all the difference! Gill, thanks! That makes me feel a lot better. It’s between glasses or surgery and we’ll find out which on Thursday. My middle son has been wearing glasses for 8 years now (since he was 2). Had to wear patch on one eye as well to exercise the eye and brain. Not easy process, but it depends on parents attitude. Never gets teased but a little self conscious still. best of luck! My Challenge: Cook all new recipes throughout January | EMMABYDESIGN. Interesting things Wednesday | Robin, Rach and Joe!